Canada unfortunately is not just a follower of the U.S. but a strong forward carrier of the British Imperial system as well. Strong racial biases, pro-Zionism, acceptance of colonial settler practices are and were well advanced in Canada without U.S. assistance. Within the current globalized world, Canada still pretends to be a ‘peacekeeper’, a thin disguise for the maintenance of the failing New World Order advocated by U.S. neocons. Our financial and corporate structures are well intertwined, with Canada’s economy reliant on the U.S. for about seventy per cent of its trade. The elevation of Chrystia Freeland to Foreign Affairs and the sidelining of Stephane Dion – a much more balanced and nuanced peace seeking minister – demonstrates the domestic requirements of Canada supporting Ukraine for the supposed millions of votes that Ukrainian descendants in Canada represent. It further represents the acceptance of the contemporary anti-Russian xenophobia created by the U.S./NATO/EU governments and media. Current aspects of international politics highlights the culpability of Canada in creating global tensions that seek out a military solution. The first, as noted above, is Canada’s role in promoting anti-Russian rhetoric and rather immature knee jerk sanctions in order to defend against an artificially created Russian threat. The comments above were in response to an article in Russia Insider, an article written by a Canadian, arguing effectively and truthfully about Canada’s Magnitsky Law. Sure, it’s not really called that, instead given the much more pleasant sounding title “Justice for Victims of Corrupt Foreign Officials Act”. It is also very carefully worded such that, while condemning extra-judicial execution, torture, corruption, bribery, and illicit material support, it only condemns those actions against people who are allegedly exposing illegal actions and/or promoting human rights. Thus the majority of those in the world who are using extra-judicial executions, torture, and who are corrupt and using bribery are not in any way affected. Therefore war criminals and humans rights abusers, numerous throughout the western political establishment – Tony Blair, George Bush, Obama, Netanyahu, Sharon and all their associates and underlings and various assorted lesser known neocons – are free to continue with their extra-judicial execution, torture, corruption, bribery, and material support of terrorists in order to try and maintain their hegemonic control over the rest of the world. In short, there are many corrupt foreign officials, but we can’t go after them because they are on our side. There are truly millions of victims of corrupt foreign officials but they are well apart from the concerns of Canada’s Government. Associated with this are the current events with Syria, and Ukraine. It is interesting to watch Trump succumb to the deep state at home, yet at the same time shake hands with Putin. I do not like Trump, as he is truly an ignorant megalomaniac, but I cannot but support his contention that the U.S. does not need to be enemies with Russia, regardless of the invented fears of the U.S. deep state and the reactionary eastern European countries. What the latter seem to forget is that it is Western Europe that has created the three major wars that have changed and decimated their territories (Napoleon, Wilhelm, Hitler). They should be more afraid of NATO starting another war – under U.S. tutelage – than worrying about Russia attacking them. As for the deep state, well, they need an enemy, and without ISIS/al-Qaeda under the rubric of the global war on terror being much of a threat – thanks in a good deal to Russia’s intervention in Syria to stop the U.S./Saudi supported terrorists – then the old bogeyman “Soviet” Russia must be recreated as the latest ultimate threat. Canada unfortunately is acting as a pawn of the U.S. within these two areas. 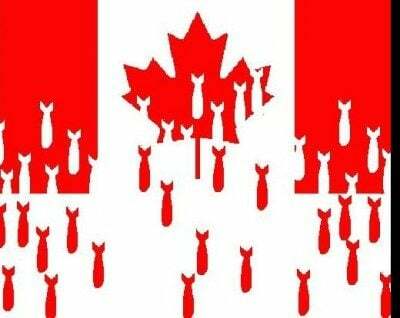 And more unfortunately, Canada has by its actions abrogated its self-declared role as “peacekeeper” and is following the U.S. ideal of achieving a pax Americana through the barrel of a gun. True, sanctions do not come from the barrel of a gun, but following the U.S. lead of sanctioning whomever in the world one does not get along with – i.e. does not accept U.S. dominance – will ultimately lead to some kind of violent action as is so well documented in U.S. history. What Canada and the U.S. ultimately fear is the decline of the US$. China has openly stated that the term of the US$ as the sole global reserve currency must end, and Russia, while not being quite as verbally open about it all, is moving along the same track. Both are working together in order to make this happen by developing their own financial systems independent of the western establishments (World Bank, IMF, SWIFT, the many card payment and money transfer systems). The current actions by the House of Saud pose some interesting questions concerning this. Are they aligning themselves up for a new world currency order? Are they going to be pricing oil in yuan for China, especially now that China is buying oil with gold redeemable yuan (to wit the recent visit of the House of Saud to China)? Has Russia made some kind of agreement vis a vis oil prices/currencies with the Saudis (to wit the recent visit of the House of Saud to Russia)? Is Saudi Arabia at all stable politically – and for how long? Canada will find itself left behind as the Eurasian continent reshapes itself away from western financial and military influence. North America will become a second rate backwater, ruled by its own oligarchs, while the majority of citizens are educated and subdued through the Orwellian attitudes of the governing class.